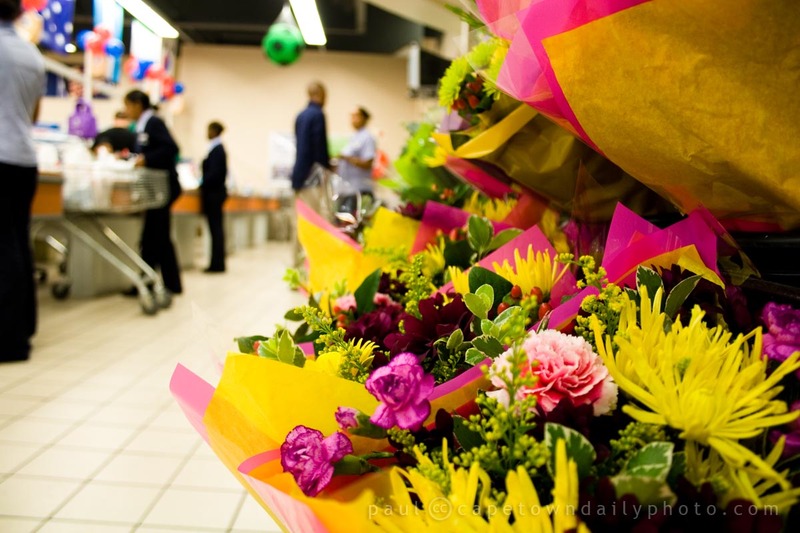 Isn't it sneaky how supermarkets place the array of beautiful flowers in a position that forces you to look at them while waiting at the checkout? I can imagine that it must make it *very* difficult for woman to decide between the chocolates (also conveniently placed where you wait) and the flowers that they seem all to love. Bunches of flowers bought in a supermarket in Cape Town generally cost between R50 and R80 (between 5 and 8 Euro). What would you pay for a similar bunch where you live? Posted in General and tagged flowers on Thursday, 20 May, 2010 by Paul. We noticed on our last trip that supermarket flowers were about the same price as in the UK. We can pay up to £20 but that would be for a really posh bouquet. Incredibly the protea bunches in Woolworth’s were the same price as the same type in Marks and Spencer’s. But out of time at a padstal the prices were about half. Considering the transport cost it doesn’t make a lot of sense but it could be due to bulk buying perhaps? Or just one of those annoying market forces “price is what people are willing to buy at” things. Thanks Pamela. Perhaps it is bulk buying, but wowie, I’d also expect them to be more expensive in the UK. I think you may be right about the the price people are willing to pay. I guess international competition is fierce, and I suppose that’s also what keeps them affordable in the UK.